A few weeks ago I received an inquiry from a customer who was looking to blow water off the inside of a closed cylinder after a zinc bonding process. There are 8 parts that are placed on a manifold which is then inverted and sent into their current blow off setup that includes small open tubes that get inserted into each cylinder to try and blow out the water. This setup worked a little but the issue they were experiencing was the airflow coming out of the tubes was blowing the water up, which caused it to collect in the “bowl” of the cylinder and as the blow off tubes were removed, the water would start to leak back out and down the inside walls again. After the current blow off, the parts are manually removed and inspected for moisture content. If the parts are found to be outside of their tolerances, an operator uses a modified blow gun fitted with a small tube to manually complete the process. After discussing the particulars with the customer, their needs were two-fold – first they needed a nozzle that wouldn’t push the air toward the end of the tube but something that would direct the air “backwards” so as they placed the nozzle inside, they could hopefully “pull” the liquid out as the nozzle is removed. The second concern was the cylinder had a small 0.390″ diameter opening so the nozzle would need to be small and powerful enough to be able to fit inside the part, while still providing effective blowoff. Once again, EXAIR offered the perfect solution, our Model # 1004SS M4 Back Blow Nozzle. The Back Blow Air Nozzle produces an even, 360° airflow that is directed away from the end of the nozzle. At only 0.20″ in diameter, The Model # 1004SS is the ideal choice for treating the inside diameter of small hose, pipe, bores (up to 1″) or in this case, small enough to fit inside the opening of the cylinder. With this design blowing the air back away from the end, the water wouldn’t get trapped in the bowl but rather would allow the inside walls of the cylinder to be wiped clean while directing the liquid toward the opening so the water can be removed. 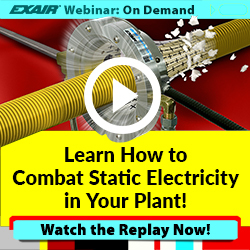 EXAIR’s Back Blow Nozzle is the perfect choice for cleaning or drying the ID of part or tube. A few weeks ago I made a video showing how the Back Blow Nozzle operates. The video is helpful to illustrate the process of pipe cleaning, but this isn’t the only application for a Back Blow Nozzle. I was recently contacted by a testing facility which provides inspection services for fire extinguishers. As part of the inspection process, the empty fire extinguishers are pressure tested by filling the empty cylinders with water and raising the pressure to a specific PSI. After passing this test, they are emptied, turned upside-down, and fed over a drying rig. 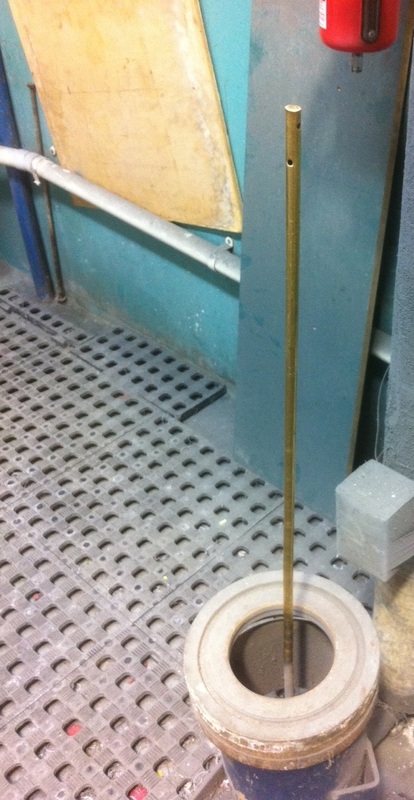 The drying rig (shown above) is a crude setup, using a brass tube with a few drilled holes. In order to sufficiently dry the cylinders with this setup, they needed to be placed on the drying rig for long periods of time, sometimes for several minutes. This long cycle time was a waste of compressed air, and the end user wanted to find a better, more efficient solution. The solution was to replace the drilled pipe with a ¼” NPT Back Blow Nozzle, model 1006SS. The angled orifices of this engineered nozzle force the air, and water in this case, from the cylinder. There is no longer a need to leave the cylinders on the drying rig for several minutes – drying is now accomplished in a fraction of the initial time. And, in addition to the improved cycle time, the engineered nozzle is able to reduce sound level from the drying rig. Back Blow Nozzles can be used in a variety of applications. If you have a process which you think could benefit from an engineered nozzle solution and you’d like to discuss with someone, contact an EXAIR Application Engineer. Joe Panfalone, Application Engineer extraordinaire, holding our bounty of product awards from 2013. He’s retired since, but he’s not…EVER…forgotten. Automation and Controls: The competition is pretty stiff in this category…I’m sure you’ll recognize the names of some major players. But, considering the wide range of applications, the potential cost savings by regulating the use of compressed air, and the convenience afforded by the ETC Dual Cabinet Cooler Systems, it’s a real contender. Environmental Health: With the ability to vacuum heavier tramp oils, thicker sludge, more viscous fluids, and “in the floor” cisterns, the High Lift Reversible Drum Vac makes fluid transfer and spill cleanup quick & easy. They’re in stock for 30, 55, or 110 gallon drums. If you want a drum dolly, additional vacuum tools, or even the drum itself, check out our Deluxe and Premium Kits. With all due respect to the other entries, it’s the clear winner in this category. Compressed Air : This has been a long-awaited addition to our already broad selection of engineered air nozzles: the Back Blow Air Nozzles, available in two sizes, can handle blowing out pipe, tube, etc. with inside diameters from 7/8″ to 16″. You can get one installed on one of our Safety Air Guns, and they’re available with Chip Shields, and extension pipes up to 6 feet in length. This is the most innovative product being introduced in this category this year, for sure. Fluid Handling : The patented design of the EXAIR No-Drip Atomizing Spray Nozzle offers a stand-alone nozzle capable of controlling liquid flow without requiring a liquid control solenoid. When the air supply pressure is shut off, so is the liquid flow…just like that. This feature is available on any of our Atomizing Spray Nozzles. 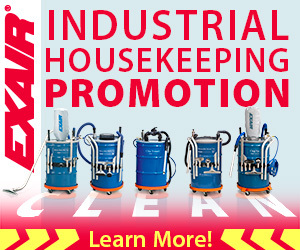 For safety, efficiency, cleanliness, it can’t be beat. Remember, voting ends this Friday. I know there are some great products to choose from, but all of us at EXAIR would genuinely appreciate your vote for our products. Of course, if you ever have any questions about how these – or any of our Intelligent Compressed Air Products – can make life easier, give me a call. Here at EXAIR we are always working to develop new technology to meet your demands and solve the problems of our customer’s industrial applications. Back on June 8th, 2015 we released our NEW Back Blow Air Nozzle. The Back Blow Air Nozzle provides a 360° high velocity, airflow that is directed away from the nozzle making it perfect for blowing out the inside diameter of pipe, bores, threads, or other critical internal diameters. The unique design eliminates the safety concern of blowing the particulate out of the end of the tube/pipe or forcing the contaminants further into the pipe, trapping them inside. We offer 2 different sizes, our Model # 1006SS 1/4″ NPT for use with inside pipe diameters ranging from 7/8″ up to 4″ and our Model # 1008SS 1″ NPT for use with I.D. pipes from 2″ up to 16. These nozzles are constructed of 316ss for durability and corrosion resistance. The Back Blow Air Nozzle is the perfect choice for cleaning the I.D. of a pipe. Developing such cutting edge technology, not only helps our customers but in some cases, earns us some much appreciated recognition. This year the Back Blow Air Nozzle has been nominated for Plant Engineering’s Compressed Air Product of the Year for 2015. This award is very meaningful as it is chosen by the reader as a useful new product for solving industrial applications. If you would like to discuss how the Back Blow Air Nozzle might fit your requirements, give us a call. To visit the Plant Engineering Product of the Year page, and vote for our nozzle please click HERE. We sincerely appreciate your vote for our products and will make every effort to exceed your expectations. Thanks for the support!